An official investigation has concluded that North Korea was behind a massive cyber attack that paralyzed the computer networks of broadcasters and banks on March 20. A team of investigators made up of military, government and civilian experts announced the conclusion on Wednesday. It also blamed North Korean hackers for the erasure of data from anti-North Korean, conservative websites and for Internet connection problem on the website of an affiliate of YTN on March 26. The investigators detected North Korean IP addresses in the process of tracing the route of the cyber attack. They said hackers have spread malware code to the networks of the broadcasters and banks at least 1,590 times using six or more PCs with North Korean IP addresses since June 28 last year. 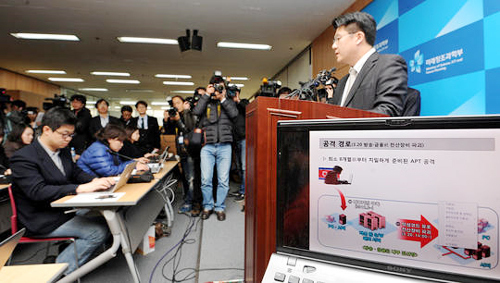 Seoul suspects that the North's General Bureau of Reconnaissance took the initiative in the latest attack.